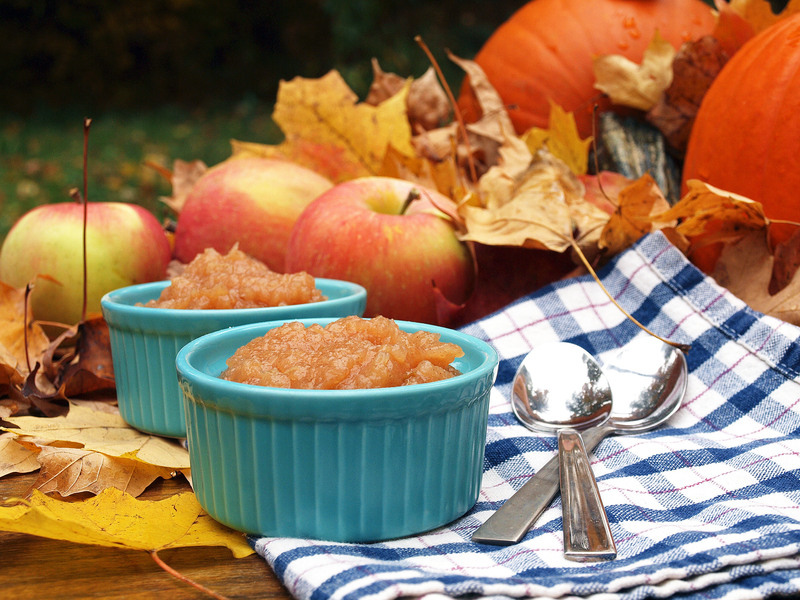 Welcome the fall weather with sweet homemade maple vanilla applesauce. Any kind of apples will work; fresh and local is best if you can get them! Grocery store apples are the types that store well and transport well, not necessarily the kind that taste best. Hit up your local farmers markets and try a new variety! Bonus to this recipe, it makes the house smell wonderful. The sweetness in this applesauce comes from the maple syrup, no sugar! Those who take part in October Unprocessed, this recipe is for you. You can use either an immersion blender (love!) or a regular blender, to turn the apples from cooked apples to applesauce. Let the apples cool before putting them into a blender unless you want every surface of your kitchen floor-to-ceiling covered in applesauce. Not all blenders can handle hot things! (guess how I learned that…) Immersion blenders are incredibly useful and can go straight into the hot apples. If you don’t want to mess with either of these things, a potato masher by hand works almost as well, it just takes more work – although this is a great time for kids to learn how much fun it is to mash things. The inspiration for this recipe comes from Serious Eats. Thanks guys! Add all ingredients to large pot and bring to a boil over high heat. Reduce to a simmer and cook for 30 to 60 minutes. Watch carefully so it doesn't get back to a boil or it will make a big mess. Remove from heat and discard cinnamon sticks. Mash with potato masher until desired texture is achieved, or let cool and puree in blender or with a hand-held immersion blender. This entry was posted in Desserts, Sauces & Condiments and tagged apples, beginner-friendly, dairy-free, fall, gluten-free, preserving the harvest, vegan, vegetarian.